India is on its way to eradicate the polio virus, as per the latest World Health Organisation data, which shows a sharp decline in the number of cases this year as compared to last year. The RSS seems to be shifting focus of its parivar outfits from Ram Janmabhoomi- Babri Masjid dispute in Ayodhya to Kashmir in its attempt to involve a wider cross-section of society in the country on issue of patriotism. The second phase of the staggered polls for the Bihar assembly is scheduled tomorrow when 45 constituencies spread in six districts of North Bihar would go to the hustings. Partha Biswas, an IB officer of the state police, and Soumyajit Bose, a schoolteacher, were kidnapped by alleged Maoists during their visit to Ayadhya Hills in Purulia today. Interestingly, around the same time Trinamool Congress and Union Railway Minister Mamata Banerjee was taking out a protest march in the city, demanding withdrawal of the joint action force from the Maoist-infested Lalghar-Jangalmahal area in west Midnapore. The Allahabad High Court today dismissed a contempt petition filed against Uttar Pradesh Chief Minister Mayawati over a speech made by her at an election rally where she had reportedly spoken in favour of don-turned-politicians Mukhtar Ansari and his brother Afzal. While dismissing the contempt petition, the court however gave her a verbal rap for her controversial statement giving a clean chit to the Ansari brothers. Maverick Bollywood filmmaker Ram Gopal Varma’slatest multi-lingual political thriller “Rakta Charitra” (blood-soaked history) has set off a storm of protests, forcing him to delete certain scenes allegedly projecting former Andhra Pradesh Chief Minister and Telugu Desam Party founder late NT Rama Rao in poor light. Turning down the Delhi police’s plea to club the cases involving senior Congress leader Sajjan Kumar with the ongoing trial in another case relating to the 1984 anti-Sikh riots, a Delhi court today held that there was no existing order, as claimed by cops, of clubbing the chargesheets and that it should be filed separately. The Chabad House, one of the affected sites in the 26/11 attacks, is all set to reopen partially in a few weeks. The first two floors of the six-storey building, also called Nariman House, will be thrown open on the second anniversary of the terror attacks next month while the rest of the building will be completed down the line. “We were supposed to complete the entire work by November 26 but could not due to shortage of funds,” says Rabbi Eliran Russo, who is overseeing restoration work. The Union Home Ministry, which has extended the ban on the LTTE, said it was unaware that the outfit's agenda was limited to fighting for a separate homeland within Sri Lanka alone. The National Investigation Agency (NIA) recently filed chargesheet against 16 persons in a case (No. 02/09) related to diversion of development funds meant for North Cachar Hill district in Assam to the coffer of militant outfit Dima Halam Daogah (J). The Supreme Court said the Centre should allocate foodgrains to all states for the public distribution system going by the number of below poverty line families estimated by the states under central norms. India has emerged as an international hub of scientific research over the last few decades but still faces a key challenge to convert the knowledge into inclusive growth, according to a report by the Academy of Sciences for the Developing World. The regional Asom Gana Parishad (AGP), the main opposition party in the Congress-ruled Assam, after snapping its ties with the BJP, is now trying to form a formidable anti-Congress force by forging alliance with tribal political groups. A Public Interest Litigation (PIL) has been filed in the Supreme Court challenging the appointment of PJ Thomas as the Central Vigilance Commissioner. In a marked shift from the early days of fiery atheist propaganda, Tamil Nadu Chief Minister M Karunanidhi recently launched a free cycle scheme for priests of village temples, who did not have sufficient financial resources. For the first time fighter Sukhoi 30 MKI of the Indian Air Force will have an indigenously developed multifunction cockpit display for pilots. A joint venture between public sector giant the Hindustan Aeronautics Limited and the Samtel Display Systems has been given the go-ahead to manufacture this sophisticated piece of equipment. The pilot of a Jet Airways’ Muscat-bound aircraft, with 122 passengers on board, was forced to ground the flight after the tip of the plane brushed against the tail fin of a parked Kingfisher aircraft at the city airport in this morning. The search and seizure operations conducted by the Income Tax Department on the Oasis Group of Companies, which has diverse business operations in the fields of hotels and liquor in this region and Madhya Pradesh, led to the surrender of concealed income to the tune of Rs 20 crore. The OPV (oral polio vaccine) is live but weakened virus given as drops to children and is the most common mode of polio vaccination in India. Most developed countries have switched to the IPV (injectable polio vaccine) which contains inactivated virus. Today, over 50 polio-free countries are using the IPV with combination vaccines. Polio is caused by wild polio virus type 1, 2 and 3; type 2 was eradicated in 1999. From 125 nations in 1988, polio is now endemic in just four countries -- India, Pakistan, Afghanistan and Nigeria. Thanks to effective surveillance of migrant population and vaccination drives, so far this year only 39 cases of polio (16 wild polio type 1 and 23 type 3) have been reported against 394 (51 type 1 and 343 type 3) during September last. For the first time, Uttar Pradesh -- the core pocket for WPV (wild polio virus) in India -- has not reported even a single type 1 case so far. Bihar -- another problem area -- has reported only three WPV type 1 cases till October 12 this year. In 2009, UP and Bihar saw 34 and 38 such cases, respectively. Similarly, while in 2009, UP had 569 WPV type 3 cases and Bihar had 79, this year up to October 12, UP and Bihar saw just 10 and 6 type 3 cases, respectively. This is a remarkable improvement considering 338 type 1 cases in Western UP in 2006, when the outbreak of 676 cases in India -- 10 times jump over 2005 -- had the world gasping. It was then believed that the Indian strain led to re-infection in Angola. The only hurdle in India has been the inability to break the transmission of type-1 polio despite reducing it to low levels. More than 96 per cent cases in 2006 were of this virulent type that paralyses one in every 200 children. Historically, most of the cases have been reported in western Uttar Pradesh and neighbouring Bihar. According to WHO, a nation cannot be declared polio-free unless there are no fresh cases reported for three consecutive years. The polio eradication deadline has already been extended thrice by over eight years. India’s gains this year are already being hailed after two national immunisation rounds since January; high-risk areas have received two additional vaccination rounds. This is the first time the most virulent strain of polio virus has hit a historic low in UP. The Indian Academy of Paediatrics (IAP) now recommends a judicious use of the oral polio vaccine (OPV) with the injectable polio vaccine (IPV) in pre-eradication phase before singly introducing the IPV in the post-eradication era. Till now, the IPV has never been used in polio-eradication programme though the government and the India Expert Advisory Group (IEAG) have repeatedly recommended feasibility studies for the same. Sangh is holding its annual four-day Akhil Bharatiya Karyakari Mandal in Jalgaon, Maharashtra, from October 28 to 31 where important leaders of all the Sangh outfits, the BJP, the VHP, Bajrang Dal, ABVP and also the Sant Sammelan are invited. The Sangh is expected to reiterate its line for negotiated settlement of the Ayodhya dispute on the lines suggested by the Allahabad High Court in its judgment of September 30 implicitly suggesting to agree to the court formula of one-third each to Rama Lalla Birajman, Nirmohi Akhara and Babri Masjid litigants and negotiate for the rest. Though the Sangh said this in so many words, RSS Sarsangchalak Mohanrao Bhagwat has urged all, including Muslims, to put behind past bickerings and work out a negotiated settlement to facilitate construction of Ram Janmabhoomi temple at the disputed spot. Also, as against the Mandir issue, there is a visible effort to raise the Kashmir issue in a big way. The Sangh helped the BJP win 11 seats in 2008 J&K Assembly elections after successfully spearheading the Amarnath yatra agitation and now it is inclined to take this further. The second phase of the staggered polls for the Bihar assembly is scheduled tomorrow when 45 constituencies spread in six districts of North Bihar would go to the hustings. 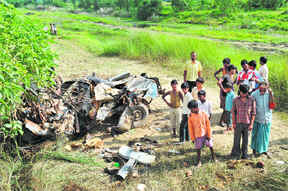 Although the state administration and the Election Commission claimed to have made elaborate security arrangements to conduct free and fair elections in Bihar, the outlawed Naxal outfit CPI (Maoists) succeeded in making their first fatal strike against the security forces on Friday night by blowing up a police jeep with the help of a land mine in which five cops, including a SHO, were killed in Naxal-affected Sheohar district near the Nepal border. Following this incident, security has been further beefed up in the Naxal-affected areas going to the polls tomorrow. The Election Commission has also changed the polling time in the constituencies,which are considered to be a hotbed of Naxals. The polling in Sheohar, Belsand, Minpaur, Paroo and Sahebeganj assembly constituencies would begin early at 7 am and end at 3pm whereas the remaining constituencies will follow the routine timings. Bihar DGP Neelmani said that Central Paramilitary Force and armed police forces from other states, besides Bihar Military Police personnel would man all the polling stations. Besides intensive patrolling by the local police officers on motorcycles and four-wheelers, the Zonal IG and Divisional Commissioner of Tirhut division, accompanied by Special Task Force would do air surveillance by an IAF chopper in the Naxal-prone areas. In the 45 constituencies that are going to polls, Lalu-led RJD has a lot at stake. Of the total 54 seats won by the RJD during the last assembly elections, the party had got 18 from here; its ally LJP had won 3. The NDA had won 17 seats, Congress had got only two seats and CPM only one. The rest were Independents. Among the 623 candidates in the fray from these constituencies, the political bigwigs whose fate would be decided tomorrow are the state unit Chiefs of both RJD and JD(U) Abdul Bari Siddiqui and Vijay Kumar Chaudhary, Congress Legislature Party leader in Bihar assembly Ashok Kumar, Ram Chandra Paswan- former Lok Sabha member and younger brother of Ram Vilas Paswan and two cabinet ministers of Nitish Kumar Ram Nath Thakur (son of late Karpoori Thakur) and Shahid Ali Khan. The Congress and BSP are contesting on all the 45 seats where as the ruling JD(U) has put up its candidates only on 28 seats and its ally BJP on 17. Lalu Prasad’s RJD is contesting on 34 seats and its ally, the LJP on 11 seats. Mamata alleged the joint action force was being utilised by the CPM for its “area capturing drive”. The CPM also was setting up camps in large areas, where unlicensed firearms and other explosives were being stored for fighting their political rivals, including the Congress and the Trinamool Congress, she alleged. She also criticised Home Minister P Chidambaram for turning a blind eye to the CPM’s “area capturing drive” with the help of the joint action force. The IB officer was on inspection duty to the Maoist-infested Balarampur area, while the schoolteacher, who also happened to be an environmentalist, was accompanying him when the kidnapping incident took place. The duo was reportedly going towards Ayadhya Hills on a motorcycle when some gun-wielding people stopped them and dragged them into a nearby jungle. Intensive searches were being conducted by paramilitary personnel to rescue them, but they could not be traced so far. “It would have been much better if such controversial statement had been kept at bay while exercising the right to woo the voters," observed the High Court. A division bench consisting of Justice Vinod Prasad and Justice Y C Gupta delivered the judgment on a criminal contempt petition filed by Alka Rai, wife of slain BJP MLA Krishnanand Rai. Every political party has got the right to allure the electorate within the parameters of law, but it is essential to keep the interest of society also in view, the court said. “We express our grave concern that to grab power, crime and criminals are now playing a major role. To gain power on the strength of such persons is neither suited for the political system and the country; nor our constitutional framers and freedom fighters ever dreamt of it to be like that,” remarked the judges. Dismissing the petition, the court observed, "We don't find a fit case to exercise our suo moto power to draw a proceeding for criminal contempt against the Chief Minister." The court pointed out that permission had already been refused by the advocate general for initiating criminal contempt proceedings against the Chief Minister, “therefore the present criminal contempt petition being devoid of substance is being dismissed”. Mayawati had declared that the Ansari brothers were innocent and had blamed the Samajwadi Party for involving them in criminal cases. Mukhtar and Afzal are in prison since 2006 for their alleged involvement in the daylight murder of BJP MLA Krishnanand Rai. At that point Afzal was a sitting SP MP and Mukhtar an Independent MLA who had the support of the SP. On the eve of the 2009 election, both the brothers had joined the BSP and were given Lok Sabha ticket from Varanasi and Ghazipur, respectively. During an election meeting in Varanasi where Mukhtar Ansari was in direct fight against BJP’s Murli Manohar Joshi, Mayawati had made the statement in his and his brother’s defence. The petitioner, Alka Rai, whose husband had allegedly been murdered by the Ansari brothers, had filed the contempt petition which alleged that it amounted to criminal contempt to have the Chief Minister giving a clean chit to Mukhtar and Afzal, who had criminal cases pending against them. However, after their defeat in the Lok Sabha elections, the Ansari brothers have fallen from grace and have been since expelled from the BSP. The two-part biopic of the gangster-turned-politician and former TDP minister Paritala Ravi hit the screens yesterday amidst demonstrations by party activists, who disrupted the screening of the film at several places across the state. The angry workers of TDP burnt the movie posters and effigies of the director. Party president and NTR’s son-in-law N Chandrababu Naidu raised objections over the way NTR was portrayed in the movie and demanded unqualified apology from the filmmaker. The movie, starring Vivek Oberoi in the lead role and Shatrughan Sinha donning a thinly veiled portrait of NTR, seeks to capture the violent politics of the faction-ridden Rayalaseema region. The film, made in Hindi, Telugu and Tamil, is a saga of betrayal and revenge in the killing fields of Rayalaseema. Following widespread protests, RGV and the film’s producer C Kalyan announced that the objectionable dialogues and scenes would be deleted from the movie. cycle of violence affecting the families of Ravi and his Congress rival Gangula Suryapratap Reddy alias Maddelacheruvu Suri forms the central plot of the film. Ravi, a four-time MLA, was shot dead in January 2005 by a sharp-shooter allegedly hired by Suri. While Vivek Oberoi plays the role of Ravi, Tamil action hero Suriya acts as his rival in the movie. Hailed by his admirers as a do-gooder and dreaded by opponents as a merciless killer, Ravi was an accused in several murder cases and had survived many assassination attempts. “Rakta Charitra’ is the story of his phenomenal rise to power and the intense, blood-curdling conflict between two factions in his native Anantapur district. This would be the third case related to the anti-Sikh riots against Sajjan Kumar. The court relied on the statement of Special Public Prosecutor BS Joon who stated that the chargesheet prepared against Kumar in 1992 cannot be clubbed with another case on which trial was already on. He added that the police were not empowered to club cases and it was the sole prerogative of the court to decide such issues. However, the Delhi police had claimed that the two cases relating to the riots were clubbed on the legal opinion provided by the prosecution branch. The chargesheet was prepared in the case based on FIR number 67/87 at Nangloi police station here naming Kumar as an accused on April 8, 1992, but it was kept in the police file and never brought before the court, the prosecutor had claimed. An FIR was registered in 1991 with regard to the killing of four persons in Nangloi here during the 1984 riots. Kumar, along with five others, was mentioned as an accused in the case but the police dropped the name of the politician. In the first stage, the Chabad House will resume its kosher kitchen and a community centre for visiting Jews from Israel. “Jews who are travelling often search for Chabad Houses where they can get kosher food,” says Russo. The Holtzbergs kept a kosher kitchen and offered lodging to visiting Jews from Israel before the terror attacks. The Chabad-Lubavitch movement has announced that it would turn part of the property into a memorial for the Holtzbergs and other victims of the terror attacks. The room belonging to their little son Moshe, who survived the attack, will be preserved the way it was on the day he was taken out of the building by his nanny. Some of the walls in the building that bear signs of the terror attacks would also be preserved. Funds for reconstructing the Chabad House came mainly from the parents of Rabbi Gavriel Holtzberg and his wife Rivka who were killed in the terrorist attack and American businessman Samuel Ritka. Israel’s Chabad-Lubavitch sect which runs Chabad houses around the world has set up a website to generate funds for reconstructing the Mumbai property. Earlier, the Brihanmumbai Municipal Corporation had conducted a structural survey of the property and certified it safe for habitation before it was handed over to the Jewish organisation. This was revealed by one of the directors in the Union Home Ministry PK Mishra, who appeared before the Unlawful Activities (Prevention) Tribunal, which held its hearing at Ooty, a hill resort in Tamil Nadu. Justice Vikramjit Sen, who headed the Tribunal, allowed MDMK leader Vaiko, who is an advocate, to cross-examine Mishra on the grounds for the ban on LTTE. Citing the ban order, which alleged that the LTTE had plans to create a separate homeland by attaching Tamil Nadu with parts of Sri Lanka, the MDMK leader asked "According to your notification, though the LTTE had been decimated in Lanka, moderate groups of the LTTE functioning in the US, Canada and Europe have formed a Transnational Government of Tamil Eelam with an agenda to create a separate homeland that included Tamil Nadu. The map and other documents which indicate the separate homeland issued by the TGTE does not contain Tamil Nadu. It contains only parts of Sri Lanka. Are you aware of this?" To this the Union Home Ministry official said, "I do not know", even while the judge called for the relevant documents submitted by Vaiko and took note of them. When Mishra said: "I do not know", the Centre's counsel Amarjit Singh Chandhiok intervened and demanded evidence to show that the activities of the LTTE supporters were being allowed in countries, which have banned the LTTE. To this Vaiko said the inaugural function of Transnational Government of Tamil Eelam was held at Philadelphia in the US and the news had been widely covered by the media. He added that he was prepared to submit those news clippings, which showed the open activities of the LTTE supporters in those countries. The judge adjourned the hearing announcing that it would continue at Chennai on October 28. Those named in the chargesheet that was filed in the court Special Judge here included the chairman and commander in chief of the DHD (J) jewel Garlosa and Niranjan Hojai, respectively, former chief executive member of North Cachar Hills Autonomous District Council (NCHADC) Mohet Hojai besides others. The rest of accused as named by the NIA are: Jibangshu Paul, Golon Daulagupu ,George Lawmthang, Jayanta Ghose, Phojendra Hojai, Karuna Saikia (government official), Partha Warisa, Malswamkimi, Sandeep Kumar Ghose, R H Khan (government official), Samir Ahmed, Vanlalchhna, Debashis Bhattacharjee. Barring Golon Daulagopo, Karuna Saikia and Jibangshu Paul all the accused are now in judicial custody. The chargesheet was filed against the accused under Sections U/S 120B, 121, 121(A) IPC, Section 16,17,18,19,20, UA(P) Act 1967 and Section 25(1)(d) of the Arms Act. The NIA had registered two cases 01/09 and 02/09 on June 5, 2009 regarding seizure of funds meant for the DHD (J) outfit of Assam. The case (No 02/09 of NIA) was registered on 5th June, 2009, taking over of case 03/09 of Police Station Diyungmukh, North Cachar Hills, Assam. 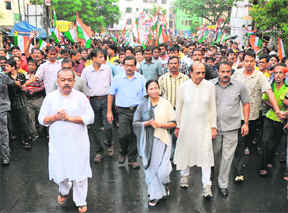 During investigation of the case, the NIA established that huge amounts of development funds were defalcated by the members of the autonomous Hill Council namely Mohet Hojai and Golon Daulagupu with the help of government servants, namely Karuna Saikia (Addl Chief Engineer, PHE), Redaul Hussain Khan (Dy Director Social Welfare) and contractors namely Jibangsu Paul, Phojendra Hojai, Jayanta Kumar Ghosh, Sandeep Ghosh and Debashis Bhattacharjee. These funds were transferred to the terrorists through Kolkata with the help of couriers/ Hawala operators. It was also found during investigation by the NIA that the funds finally reached the Arms dealer Vanlalchhana of Mizoram through operators at Kolkata named Malsawmkimi and George Lawmthang. This Arms dealer Vanlalchhana further supplied Arms for the DHD(J) on the directions of the “commander-in-chief” Niranjan Hojai and the chairman Jewel Garlosa. A large number of sophisticated Arms including 27 AK series rifles and M-16 rifles were recovered during investigation by the NIA. The agency also arrested two more cadres of the DHD(J) namely Partha Warisa and Samir Ahmed who were actively associated with Jewel Garlosa. The investigation of the case was spread over five States of India namely Assam, Meghalaya, Mizoram, Karnataka and West Bengal. The case also had international dimensions with the leaders of the DHD(J) reaching out to Nepal, Thailand, Singapore and Myanmar for conducting and supervising operations in North Cachar Hills by remaining away from the areas of operations. The Commander-in-Chief of the DHD(J), Niranjan Hojai used his contacts in Myanmar to organize the procurement of Arms for the DHD(J) utilizing the defalcated funds from the North Cachar Hills. He then channeled the supply of arms with the help of Arms dealers of Mizoram through the Mizoram-Myanmar border. A Bench comprising Justices Dalveer Bhandari and Deepak Verma made the observation after finding huge gaps between estimates of below poverty line families made by the Centre and states. Invariably, states had higher figures. Haryana’s Additional Advocate General Manjit Singh Dalal informed the Bench that the state government’s estimates were as much as 60 per cent higher than that of the Centre. While the Centre was allocating foodgrains for only 7.89 lakh families, the state had to meet the demands of 12.97 lakh below poverty line families. The state was, however, meeting all the requirements using its own resources. The Bench asked Punjab and other states, which had not provided the relevant figures so far, to submit these by October 27 and fixed October 29 as the next hearing for passing orders, asking the Centre to make adequate allocations to all states. Bihar informed the court that a revision of below poverty line families done in April-May this year showed that their number had gone up by nearly 14 lakh to touch 1.25 crore. This supported the contention of the PIL petitioner -- People’s Union for Civil Liberties -- that the incidence of poverty in the country was in fact going up, belying the government’s claim that it had come down from 37 per cent to 26.5 per cent over a 10-year period. Senior counsel Colin Gonsalves, appearing for People’s Union for Civil Liberties, lamented that the government was globalising everything but kept lowering the poverty level bar. At present, everyone who spends Rs 17 a day in Delhi and Rs 11 a day in remote villages is considered to be above the poverty line. For other places, the amount is between these two figures. “The long-standing question of whether India will ever emerge on the world stage has largely been answered. In that sense, India is indeed on a roll,” the academy, formerly known as the Third World Academy of Sciences (TWAS), said in a report published on the eve of its 21st annual meeting held here. The report titled “Rising India” analyses the growth of scientific research in the country across a myriad sectors and also the challenges ahead. Noting that liberalisation and relaxation of bureaucratic framework in the early 1990s had “unleashed” scientific capabilities in the S&T institutes, it said the country had since seen a steady annual growth of over 15 per cent in government spending on research and development. “Most importantly, the reforms process has set India on a path to becoming an enterprising, innovative country - a process that is still unfolding nearly 20 years later,” the report said. India now has a critical mass of well-educated professionals and a vast pool of scientists and technologists and emerged as one of the world’s powerhouses of scientific research, TWAS editor Dr Daniel Schaffer, who authored the report, said. India’s success in scientific and technological capacity building and future plans has been widely-recognised and hailed across the globe, particularly in developing countries. Indeed, some developing countries are now looking to India as a possible model to follow. However, the country still has a long way to go to catch up with the developed world. Its R&D spending -- as a proportion of Gross Domestic Product (GDP) -- at one per cent, lags behind nations such as China, South Korea and Taiwan. India contributes less than three per cent of the global research output. And there is a huge difference between India and China in terms of the number of patents filed. China received over 2,400 patents in 2006 as against India’s 648. India has about five million people working in S&T. Yet, its ratio of S&T workers to the overall workforce is 120 per one million. In China, it is 715, South Korea 3,700 and in the US it is 4,600. “When observers look at where India has been and where it is heading, they see a rapidly emerging economic and scientific powerhouse that is successfully drawing on its expanding capabilities to build a vibrant society characterized by prosperity and confidence. India has a complex web of S&T organisations that are moving ahead at breakneck speed,” the report said. The tribal political groups that are being wooed by the AGP are: Karbi tribe political party the Autonomous State Demand Committee (ASDC) that has stronghold in the two hill districts of the state ; Bodo tribe political group the Bodoland Progressive People’s Front (BPPF) that has strong base in Bodo tribe dominated districts in the state and the Ganashakti Party that has base in two upper Assam districts of Lakhimpur and Dhemaji. BPPF leader and former MP, UG Brahma said the party was contacted by the AGP leadership for an alliance for the next Assembly election. Both the parties had fought the last Bodoland Territorial Autonomous Council (BTAC) polls jointly. The ASDC leader said though the AGP did not have a strong base in the two hill districts it could help the ASDC win votes of Assamese speaking people in both the districts. The PIL filed jointly by two NGOs - Centre for PIL and Common Cause - pointed out at Thomas’ alleged role in the Rs 70,000-crore 2G spectrum scam and the irregularities in the import of palmoleine. The litigation sought a direction declaring Thomas’ appointment as illegal and claimed that it was in violation of Section 4 of the Central Vigilance Commission Act. The petition said the government had gone ahead with the appointment ignoring the objections raised by the Leader of Opposition in the Lok Sabha. Thomas was Secretary in Kerala’s Department of Food and Civil Supplies at the time of the palm oil scam and had to secure bail from a local court, the PIL claimed. He was again Secretary in the Telecom Ministry at the Centre when the 2G allocation took place, it added. The Supreme Court and Parliament had held that the three-member committee, including the LoP, would select the CVC. The government’s interpretation that the selection would be done by the committee through majority had made the presence of LoP meaningless, the PIL contended. The DMK leader, whose forceful dialogue against priests in the film “Parasakthi” in the early 1950s, catapulted him to the status of one of party's key leaders, received 200 temple priests at the Secretariat with a smiling face and handed over the keys of new cycles to them. The government also announced that 10,000 free cycles would be given to village temple priests at various functions throughout the state. Thousands of temples in villages do not have a permanent priest for lack of sufficient income. So, a single priest has to look after many temples and perform poojas, for which funds are being provided by the Hindu Religious and Charitable Endowments Ministry. The priests were having a difficult time transporting from one temple to another. Free cycles to temple priests will help them to move from one temple to another and perform poojas. This will ensure that none of the temples remain unattended, an official press release said. The DMK government had allotted Rs 2.78 lakh for providing free cycles to village priests. In the first phase, priests from three districts around Chennai would receive free cycles. These will replace the multifunction displays used in the Sukhois. The HAL is producing the Sukhois under licence from Russia. The Centre for Military Airworthiness and Certification has approved the design. Deliveries of the new displays will commence next week. Till now the displays were imported. Before the approval, the display was flight tested extensively, a spokesperson for Samtel said. The multi-functional display (MFD) is a device that brings all aircraft-system monitoring and flight planning functions at the pilot's fingertips. Engine performance and situational data such as location, terrain, traffic, weather and airport information are all digitally depicted and can be quickly interpreted at a glance on the large-format display. The HAL-Samtel JV was formed in 2006 to meet the HAL demand for avionics. The JV plans to induct cockpit displays across all platforms of HAL. The incident took place around 2.05 am when the Jet aircraft was pushing back for take-off, airport sources said. Confirming the surrender, DG Income Tax (Investigation) BL Razdan said the owner was now liable to pay tax on this disclosed amount.